MonTECH is Montana’s access point for assistive technology. Any Montanan with any disability can borrow devices and equipment from MonTECH. Items can be borrowed to meet a temporary need or assess the usefulness of the device. Last fiscal year, MonTECH loaned over 800 assistive devices and pieces of adaptive equipment to Montanans. Being fed by his parents at home wasn’t a big deal for Heath Montgomery. As a fourth grader with cerebral palsy, he was used to it. But being fed at school in front of peers? “It was just really weird having other people watching me while I was getting fed by an adult,” he explains. MonTECH arranged a trial of Obi, a robotic feeding device. 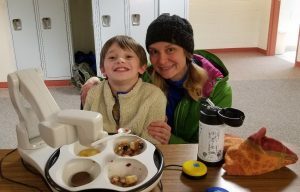 Thanks to Heath’s proven experience with the robot, combined with mom Jenny’s research on the health benefits of self-feeding, the Montgomerys were able to pursue funding for an Obi. Now Heath’s Obi allows him to eat independently. Free learning sessions in our labs in Billings and Missoula or provided virtually through platforms like Zoom or FaceTime. Time to explore technologies selected with specific challenges in mind. 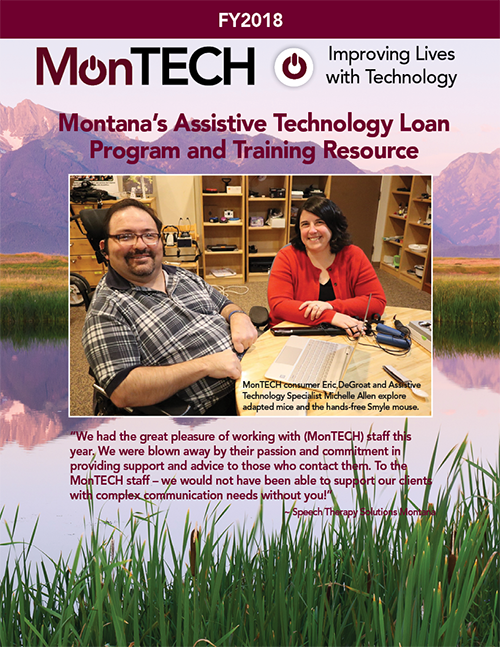 This fiscal year, 992 Montanans received free demonstrations or training on assistive technology devices through MonTECH. 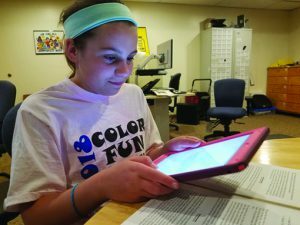 Sixth-grader Olivia Hawley has dyslexia and dysgraphia. For Olivia, school was a source of constant anxiety. She came to MonTECH with her mother, Kimberly, looking for help. During her 1:1 demonstration in the Missoula lab, Olivia tried multiple apps and devices to see what might best support her academically. She now uses an iPad in the classroom, with apps to help her ‘ear read’ and fill out worksheets. Buying new is not always an option. With this in mind, MonTECH hosts a reuse-exchange forum on our web site. Anyone can post a disability-related item to sell or give away. MonTECH posts older devices for re-use and long-term loans. The benefit of MonTECH’s re-use program has increased over the past two years. In 2015-2016, we saved consumers $80,023 through our open-ended loans and device exchange. In 2017-2018, we saved consumers $230,055. 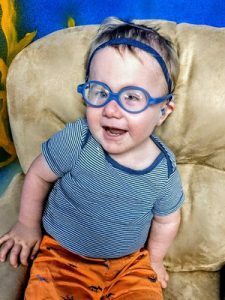 Two-year-old Caleb Casey faces a number of medical and developmental challenges, but with the support of his large and loving family, he consistently defies expectations. 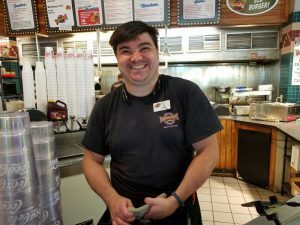 One obstacle recently eliminated was his need for support while walking. Caleb now uses a gait trainer that was formerly in MonTECH’s adaptive equipment inventory. With the assistance of his gait trainer, Caleb can take advantage of increased independence and spontaneous social opportunities. It can be difficult for people with disabilities, often living on limited incomes, to purchase technologies and equipment vital to quality of life. To help meet this need, MonTECH provides an assistive technology loan option through Rural Dynamics (now affiliated with GreenPath). Approved applicants can borrow up to $1,500 for assistive technology at zero percent interest, or up to $50,000 at 3.5% interest. Contact Elaine Szirbik for more information: 406-454-5712, elaines@ruraldynamics.org. MonTECH financial loans have increased dramatically over the past two years. In 2015-2016, we granted 1 financial loan to a consumer who needed assistive technology. In 2017-2018, we granted 16 financial loans. 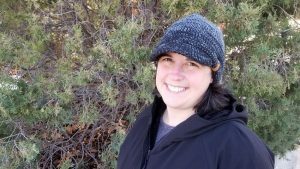 Sarah Imoe moved to Montana to be near a new grandchild. Reliant on a power chair due to progressive multi minicore myopathy, it didn’t take long to realize she would need an accessible vehicle to transport her chair. “I was limited in the amount of money I could apply to repayment,” Sarah explains. “I was getting desperate. 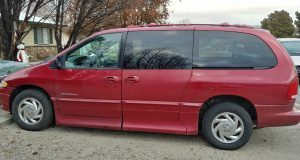 Then I heard about the loan program and thought, it doesn’t hurt to try.” Through the assistive loan program, Sarah was able to purchase a reliable, accessible van. Having her own vehicle means Sarah can now independently pursue interests: shopping, attending church, and, of course, loving on those grandchildren. MonTECH provides trainings and presentations around the state, but it is always particularly rewarding to present to support groups. Support groups allow discussion of assistive technology specific to members’ shared challenges, and feature opportunities for hands-on experience of AT. 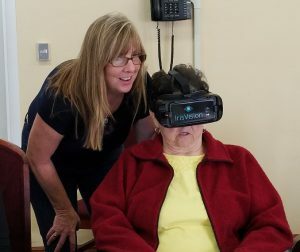 Here, Diane Gray (vision rehabilitation therapist with Vocational Rehabilitation) assists Nova Berry with MonTECH’s wearable IrisVision magnifier at a recent low vision support group. Spring 2018 marked MonTECH’s move across the UM campus to McGill Hall. Our new space has greater parking capacity, improved accessibility, and is conveniently located near campus landmarks like the Washington-Grizzly Stadium and the University Center. MonTECH’s Billings office is in the Montana Center for Inclusive Education on the MSU-Billings campus. 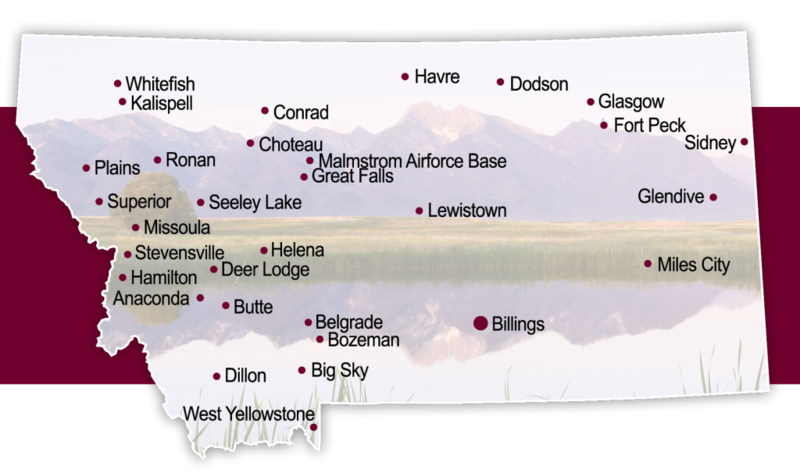 For an appointment in Billings please call (406) 657-2089. Yep, that’s 129 cities and towns, 56 counties, 147,000 square miles, and 10 hours of drive time to get from east to west. This map shows all of the communities our team visited in 2017-2018.